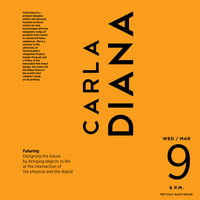 Join Carla Diana, designer, author and educator, for a lecture about bringing objects to life at the intersection of physical and digital to design the future. Please mark your calendars for March 9 6-7PM at the Metcalf Auditorium, Chace Center/RISD Museum. This lecture is sponsored by the Industrial Design Department at RISD and the Human Centered Robotics Initiative (HCRI) at Brown University. Carla Diana is a product designer, author and educator focused on future visions for new technologies who has designed a range of products from robots to connected home appliances. She is a Lecturer in the University of Pennsylvania's Integrated Product Design Program and a Fellow at the innovation firm Smart Design. Her book LEO the Maker Prince is the world's first children's book on 3D printing.